Hydrangeas are deciduous plants known for their large heads of long-lasting blooms. Perhaps most of us know the type that has blue flowers when planted in acid soil and pink when in soil that is more alkaline. However, there are many other types of hydrangea from big snowball like white blooms to delicate lacy varieties. These shrubs are easy to grow, hardy and resistant to most pests and diseases. The huge range of varieties means there is a hydrangea to suit every garden. This guide will cover how to choose the right varieties for your garden and give advice on how to plant and care for your shrub. It will also explain how to overcome any problems, pests or diseases you may encounter. Hydrangeas come in many varieties. The most well know are the mop-head varieties and the Lacecaps. Some varieties originate in Asia and others in the Americas and the two types need to be treated differently in order to thrive. The varieties can be separated 4 main groups: bigleaf, oakleaf, panicle and smooth leaf variety. They are all relatively easy to care for and provide a wonderful summer display. Hydrangea macrophylla or big-leaf hydrangeas are the colourful varieties that we know so well. These are the types that have pink or blue blooms depending on the pH level of the soil. 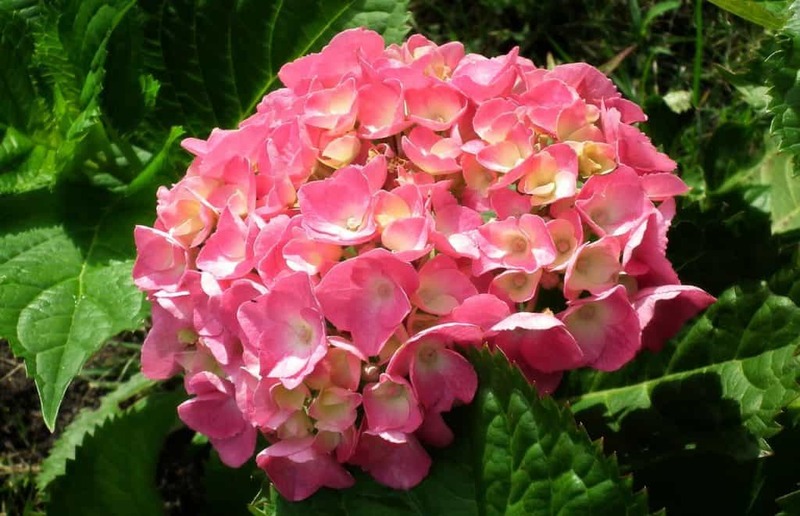 There are two types, Hortensia, which have the big rounded balls of flowers and lacecaps which are more delicate. Good varieties of Hortensia include Nikko Blue and Carmen. Blue Wave and Coerulea are good blue types of lacecaps. Both varieties have red and orange autumn colour. This variety is of Asian origin and prefers moist conditions and an acid soil. They may fail to flower if planted in limey or chalky soils. Hydrangea arborescens or smooth leaf hydrangeas have extremely large, round flower heads that can reach 10-12 inches across. They are not quite as hardy as other varieties and so will need a sheltered spot and possibly some protection from harsh winters. Anabelle is one of the most popular of this variety. This is an America species that is drought tolerant and will cope better with alkaline soil than the Asian varieties. These varieties flower on new wood and so can be pruned in late spring back to the shooting bud. Hydrangea Paniculata is the hardiest type and also prefers more sun than the big-leaf varieties. They have cream-coloured flowers and the blooms are cone (panicle) shaped. Grandiflora is a good example of this variety. It has huge white blooms that slowly turn pink as they age. It is also one of the largest, reaching the height of a small tree over time and in the right conditions. Hydrangea quercifolia has leaves shaped like oak leaves. They also have brilliant autumn foliage. The flowers are white, though some age to a pinkish hue. The blooms are cone-shaped and can be single or double. This is an American variety and can withstand drought better than the Asian types. Snowflake features double blooms, while Sikes Dwarf is a compact variety suitable for a smaller garden or container. Hydrangeas are generally easy to grow and care for. The different varieties do need slightly different conditions, so check the individual plant for more detailed instructions on care. Most hydrangeas prefer to be located in full sun or partial shade. However, they do not like exceptionally hot, arid conditions so if your garden receives a lot of sun they will prefer to be a little protected from the worst of the heat. Hydrangeas usually need a deep watering about once a week. In very dry weather they may need even more. It is best to give them a thorough watering rather than a light sprinkling every day. Water your plants at the base rather than on the leaves to help prevent too much humidity which can encourage fungus to thrive. Water early in the day to allow any moisture on the leaves to evaporate. The American varieties are more drought tolerant than the Asian ones. Hydrangeas can grow in a wide range of soils including acid and alkaline types. However, the Asian varieties need acid soil in order to flower. All types prefer a rich soil that is moist but free draining. If planted in dry soil they will need more watering. If your soil is poor, then adding extra compost and organic matter can help them thrive. Fertilize your shrub in early spring to support new growth and plentiful blooms. You can use an organic soil improver or a slow release shrub fertilizer. You may like to repeat this in summer, depending on your soil conditions. However, do not fertilize after August as this can encourage new growth that will be too tender to survive harsh winter weather. There are special hydrangea fertilisers available, but these are not really necessary. Do not be tempted to over fertilise your shrub. If your plant is looking sickly it is important to find out exactly what is wrong rather than just feeding it more. Over fertilising can cause more problems for an already stressed plant. Hydrangeas also benefit from an application of liquid iron every two years. This will keep the leaves nice and green and healthy. This is particularly important for the Asian varieties. If you are growing a pink or blue variety, you can keep the colour you want by adding small quantities of either sulphur or lime to the soil. Lime will result in pink blooms and sulphur will turn them blue. This will not happen overnight, so you will have to be patient. You should plant your hydrangea in spring once all threat of frost has passed. Dig a hole twice the size of the rootball and add some soil improver or compost. Plant level with the surrounding soil and water in well. Add a layer of mulch to help retain moisture and suppress weeds. Do not let the mulch touch the base of the plant to reduce the risk of rotting. If you should need to move your shrub for any reason this should be done in autumn or winter when the plant is dormant. Try to make sure you get the whole rootball and replant immediately to avoid stress to the plant. To keep your hydrangea looking at its best you should dead-head it whenever the blooms become spent. This will divert the plant’s energy to new growth and blooms. The correct way to deadhead your hydrangea depends on the time of year. Before August spent blooms should be cut back to a larger branch on which new buds are present. After August, there will be buds on the stems in preparation for next year’s blooms, so you should cut back only to these. Cutting back further at this time of year may result in a loss of flowers the flowing year. In winter it is sometimes appropriate to leave the spent blossoms on the plant. This is because the new buds for next years growth are just below the old blossoms so leaving them on can provide protection for these tender buds over winter. Hydrangeas are often given as gifts in small pots but unless re-potted these will rarely last more than a few weeks. 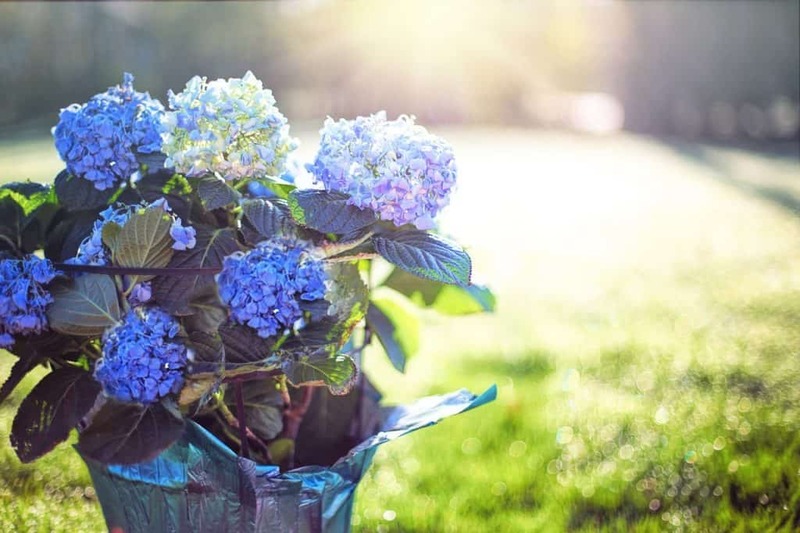 Ideally, you need to re-pot hydrangea into a container several inches larger than the one it came in to give its roots access to plenty of moisture and nutrients. Ensure the pot has plenty of drainage holes so that your plant doesn’t sit in water. Leave a few inches between the potting compost and the rim of the pot. This will enable you to water it well without water and soil spilling out of the pot. Hydrangeas like plenty of sun, however, they do not like to dry out. For this reason, it’s best to put your container-grown plant in a place that gets morning sun, but a little shade in the hottest part of the day. Your container grown hydrangea may need some protection in winter. You can place it in a cold greenhouse or protect it with fleece. Remember not to let it dry out over winter. It will not need much water, but it will require some. If your hydrangea is not a dwarf or compact variety it may need repotting again in time, or alternatively, you can prune it to the size you want. Make sure you prune it at the right time of year for the variety or you may lose the next years blooms. The different varieties of Hydrangea have different pruning needs. The most common types, the mopheads and lacecaps of the H. macrophylla variety usually need pruning after blooming in late summer. The oakleaf varieties are best pruned in early spring. paniculata should be pruned in late winter or early spring, though the spent flower heads can be cut as they die back. Softwood cuttings are taken in spring and early summer. Cuttings are taken from the soft flexible tips. You should take your cutting early in the day when the plant is full of water. Choose a healthy, non-flowering tip and remove a stem of 10 centimetres (4 inches) in length with a clean, sharp knife. Prepare a 4-inch pot filled to half an inch from the top for each cutting. Make a hole in the compost with a dibber or pencil. Trim the base of the stem to just below a leaf joint. Remove the leaves from the lower third of the stem and pinch out the tip. Dip the base of the cutting in hormone rooting powder and push the stem into the hole up to the first leaves. Mist the pot well and cover with a plastic bag or in a propagator and position somewhere bright but out of direct sunlight. Check your plant weekly and remove the bag to allow for air circulation for at least ten minutes. Remove any dead or dying matter. Water and replace the bag. Cuttings should root in around 6-10 weeks. Hardwood cuttings are taken in autumn, after leaf fall, or early spring, before bud-burst. Select vigorous shoots from the current year’s growth and cut off with a sharp knife. Remove the soft tip growth and cut each stem into sections of 15-30 cm (6 -12 inches) with the top cut being at an angle and just above a bud. Cut straight across at the base below a bud and dip this end in rooting hormone powder. Insert the straight end into well-prepared ground outdoors or pots. Keep the cuttings moist and leave until the following autumn before transplanting. Hydrangeas are usually fairly resistant to pests and diseases. However occasionally one of the following may give your plant some trouble. If your plant is infected with hydrangea scale, you may see the oval white eggs attached to the stems of the plant. These little sap-sucking insects can affect the growth of your plant. A mild infestation can be solved by scraping off the eggs. Severe infestations may require a pesticide which should be applied in mid-July. Applications may need to be repeated to break the life cycle of these pests. Aphids such as blackfly and greenfly can cause distorted leaves making it harder for your plant to photosynthesise. They can be removed with a strong jet of water or by spraying with a soap solution. Rose chafers are a beetle that can sometimes eat the leaves and flowers of your hydrangea. They are often best removed by hand, though a pesticide may be required if the infestation is widespread. Hydrangeas are usually resistant to most diseases. Good hygiene can help to keep your plant in excellent condition. In particular, ensure sure all pruning tools are sterilised before each use. This fungal disease appears as purple to brown spots on the leaves of your plant. It is rarely fatal, but it can weaken the plant. To prevent the spread of the disease, clear up all debris from around the plant and dispose of it in the rubbish or by burning to prevent re-infection. Reducing humidity and improving air circulation can make your plant less attractive to fungal infections. Make sure you water your plant at the base, rather than the leaves. Also, thin out crowded and crossed over stems to allow better air circulation. You may want to cut back up to a third of the branches within the crown. You should also cut back any other plants that are encroaching on your hydrangeas space and remove any weeds from the surrounding area. In bad cases, there are fungal sprays that you can use to treat leaf spot fungus. If your plant is suffering from powdery mildew you will see powdery white patches on the leaves. You should remove all infected material and put it in the rubbish rather than the compost to prevent reinfection. Increasing air circulation can help to solve this problem. Good watering techniques will also help prevent this disease. Water at the base of the plant and do so early in the morning to allow any moisture on the foliage to evaporate quickly. You can also use a fungicidal spray to clear up this fungus. Rust shows as orange or reddish pustules on the leaves, which is what gives the disease its name. However, the pustules can sometimes be brown, black or white. If only a few leaves are affected you should pick these off, however, if lots of leaves are affected it may do more harm than good to remove them. At the end of the season, all diseased material should be removed and destroyed. Often, no treatment is needed as this disease develops late in summer and will not have a significant effect on the health of your plant. However, a fungicide may be used if required. Q The leaves of my hydrangea are turning purple. Is there something wrong? If the purple is in patches it may be that your plant is suffering from Cercospora leaf spot. However, if the leaves are turning purple all over rather than in patches it could indicate a phosphorous deficiency. Many hydrangeas like very acidic soil. However, if the soil becomes too acidic, chemical compounds in the soil bind the phosphorous which makes it impossible for the plant to use. Check the pH level of your soil and if necessary, add some phosphorous fertilizer to the plant’s root zone. Q My hydrangea looks quite healthy, but it has no flowers. How can I get it blooming again? There are several possible reasons why your hydrangea is failing to flower. It may not be getting enough sun; these plants need around 3 hours of sun each day to flower well. You may have pruned it at the wrong time; most hydrangeas need pruning straight after flowering to allow new growth and new flower buds to develop for the following year. This does depend on the variety though so check the pruning advice above for more details. Other possibilities include soil that is too alkaline, hard frosts in early spring have damaged new buds, or too much nitrogen, which has encouraged leafy growth at the expense of blooms. Q The flowers on my hydrangea fade very quickly. How can I make them last longer? This could be caused by too much sun, too little water, or both. Try giving your hydrangea a good soaking once a week to see if this helps. If your plant is exposed to strong sunlight you might need to move it or create some shade at the hottest part of the day.